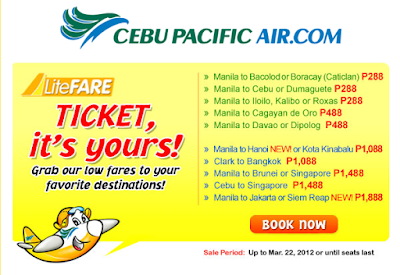 Cebu Pacific Promo Fares 2019 to 2020: Low Promo Fare 2012: Fly now to any destination! Low Promo Fare 2012: Fly now to any destination! 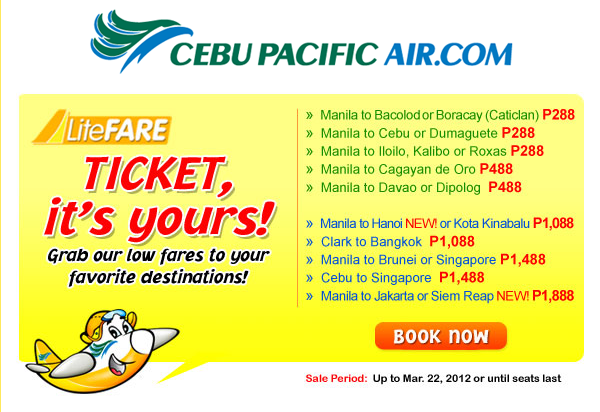 Fares from Manila, Cebu or Clark to any of CEB’s 19 international destinations are available at half the price. Guests may choose to book seats to Brunei, Cambodia (Siem Reap), China (Beijing, Guangzhou, Shanghai, Xiamen), Hong Kong, Indonesia (Jakarta), Japan (Osaka), Korea (Incheon, Pusan), Macau, Malaysia (Kuala Lumpur and Kota Kinabalu), Singapore, Taiwan (Taipei), Thailand (Bangkok), Vietnam (Ho Chi Minh and Hanoi). “We encourage all our guests to take advantage of the half-priced fares that this seat sale offers. Travelling during the lean months of May until September means that they can get the best deals in hotel and other arrangements, so they can make the most out of their vacation,” said CEB VP for Marketing and Distribution Candice Iyog. Summer Promo 2012: Half to Go!